Why conference committees keep choosing Promaco? We give you only the best. Promaco Conventions can provide your conference with the most comprehensive and professional organisation and management service in Perth. With vast experience at both the national and international levels, our fully trained and experienced staff will handle all of your conference requirements. We lighten your load. Directed by your Executive Committee, Promaco will shoulder responsibility for all aspects of the administrative and secretarial work throughout the organisational period and during the conference itself. We ensure that all committee decisions and activity schedules are carried out, and all you need to do is point the way. We give you ‘value for money’. Promaco does not sub contract any of its management services, and there are no hidden charges for the extra effort we put in. The attention we pay to all the details of your conference is included in our management fee, as part of our professional service. We offer you personalised service. On appointment, we will make sure to get to know your needs and customise our services to your requirements. Getting to know your goals and objectives on the event is very important to us to make sure we get you what you want. We go the ‘extra mile’. At Promaco Conventions, we ensure that each event receives our full, personal service at all times. By always going that extra mile, we maintain the highest standard in all that we do, and earn our reputation as the most professional conference organisers in Perth. 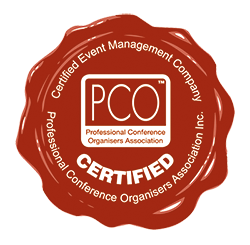 Promaco Conventions was established in 1987 to provide professional management services to associations or organisations planning a conference and/or exhibition.